Dai Ware Naturals based on the belief that their customers' needs are of the utmost importance. They are a web-based company, that continues to grow because of their outstanding customer service, and of course their fabulous products. They make EVERY product from scratch. I love companies like this, they put lots of time and work into all their products, so you know your getting a grade A item!! My favorite was their handmade bar soap which you can tell was made by hand! They come in tons of different scents. Lavender Peppermint, Honey Almond, Rosemary Peppermint & Vanilla Bean. That's just to name a few ! 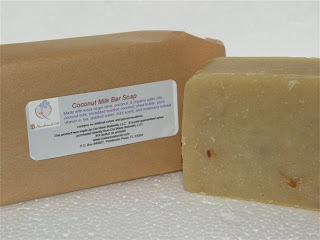 I tried the Coconut Milk Bar made with extra virgin olive oil, organic palm oil, coconut oil, coconut milk, toasted coconut flakes, pure vitamin E, water, shea butter, and rosemary extract.Has a creamy lather and smells delicious! No artificial colors or preservatives here!! This soap goes for $5.00, is in stock and is SO worth the price. And it's beautiful enough to put out for a pretty decoration, or use in the shower or bath. They are also discontinuing their foamer line so until all inventory has sold, all foamers will be 1/2 off!! Their foamers foam scrubs are paraben-free and propylene glycol-free. They all contain a gentle soap foam which has been found to be extremely gentle on the skin. It will give you a rich, fluffy lather, while it exfoliates your skin. 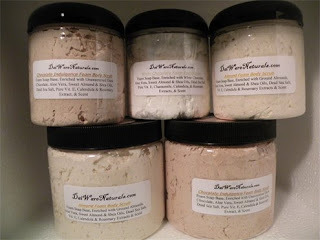 Made with dead sea salts, aloe vera, pure Vitamin E, and other treats for your skin. Some have found them great to shave with. They are light to the touch and smell awesome! Try it out with their matching body butters. You can request a free catalog to their company HERE & for a limited time, if you purchase anything from their online shop and mention this blog you will get a free gift with your purchase!! The prices are fabulous, and the soap is one of the best out there, so head on over to Dai Ware Naturals and let them know who sent you!